Master Sgts. 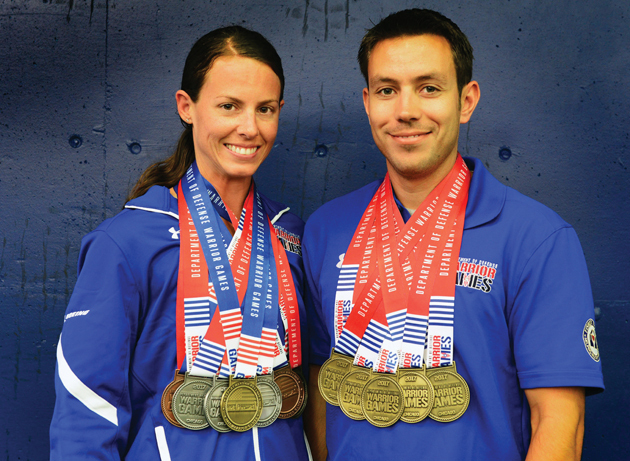 Linn Knight and Kenneth Guinn, explosive ordnance disposal specialists assigned to Tyndall Air Force Base, Fla., pose for a photo with their official Warrior Games medals July 8 at the University of Illinois at Chicago. CHICAGO — Thousands gathered to witness an extraordinary display of resilience and strength by the nation’s wounded, ill and injured service members and veterans representing all branches of the military during the 2017 Department of Defense Warrior Games in Chicago. The lives of two Air Force master sergeants became forever intertwined, as if guided by fate, leading them toward a chance to serve as teammates and represent Team Air Force at this year’s games. Growing up in the Lone Star state, roughly 1.3 miles separated Master Sgts. Linn Knight and Kenneth Guinn, both explosive ordnance disposal troops currently stationed at Tyndall Air Force Base, Florida, perhaps not the starkest similarity, but the beginning of many. 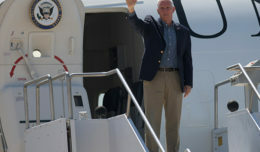 The pair, who would not officially meet until 2010, joined the Air Force in 2004 – Guinn in June and Knight in July. After attending separate technical training courses, Knight, a former lab technician who later cross-trained into the EOD career field in 2009, and Guinn both received orders to Joint Base San Antonio-Lackland, Texas, as their first duty station, living in dorms roughly 100 meters apart. Recognized as superior performers, the two Airmen earned senior airman below-the-zone during the same cycle. 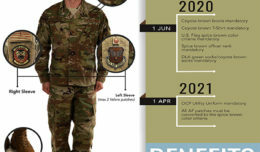 With that promotion motivating the two, each earned promotion to staff sergeant their first attempt the same year, with line numbers separated only by several hundred. Today, their friendship and wingmanship is obvious, but their story of these chance coincidences collided in 2010 when the duo was tasked to deploy as part of a team supporting the United States Marine Corps in Afghanistan. Still strangers to one another at that time, Knight and Guinn experienced a moment most Americans can only understand by watching a Hollywood production. Knight and Guinn found themselves targets of a command detonated improvised explosive device while traveling in two separate convoys, each within an hour of each another, separated by approximately one kilometer. As the driver of a different vehicle several streets over, Knight recalls the blast best by the memory of her hands being forced off the steering wheel in slow motion. “I remember looking out at empty streets, which is never a good sign,” she said. “Then, I remember time slowing following the explosion and my helmet getting slammed into the ceiling of the vehicle overhead light”. Both members’ names were placed on a casualty report due to traumatic brain injuries, officially enrolling them in the Air Force Wounded Warrior program – on the same day. Despite the program making multiple attempts to make contact with the two Airmen, both initially dismissed AFW2’s invitation to get enrolled and begin their own healing processes. For Knight, it was the perception that some military communities placed upon perceived weakness that prevented her from seeking assistance sooner. “That fear-based perception is only amplified for a woman … I didn’t want to be perceived as a weak woman,” she said. “We are a very male-dominant career field. As a woman, whether you like it or not, people will notice you in both good and bad scenarios. In our career field, once a weakness is perceived, it’s usually over, and I didn’t want to be that person. I was willing to suffer in silence in order to put the mission first. Each of them was suffering in silence, afraid to seek the help they needed in fear of losing their clearances and future deployments. Unfortunately, both Guinn and Knight reported they had sub-standard experiences with medical staff that only set them further back on their road to recovery. Knight echoed similar circumstances with medical providers. After several negative experiences, Guinn lucked into a slightly different medical approach while deployed to Dhafra Air Base in the United Arab Emirates in 2013. While Guinn was finally taking small, positive steps toward his own journey toward recovery, Knight was experiencing a defining chapter in her life while stationed overseas in Korea. The lump Knight felt turned out to be stage-three breast cancer, but it took persistence to get her initial concerns addressed seriously by local providers. After chemotherapy, radiation and several operations to overcome cancer, Knight felt it was time to give AFW2 a chance. “When I went to my first camps, I told myself [and others] I was there because I had struggled with breast cancer,” she said. “But because I had cancer, I was afforded the chance to revisit the program and finally take care of some of those old demons buried within myself. All of the care I received from the program was helping me deal more productively and in a healthier way with some of the issues, I faced earlier in my career. 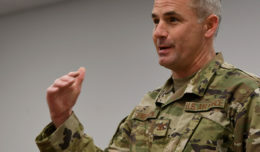 Knight was approached by a local public affairs team and asked to share her story in a video that was eventually shared across Air Force social media channels. Having lost touch with her since their deployment, that video made its way to Guinn who was alarmed to find yet another similarity between them – several small masses under the right side of his chest. Guinn underwent a preventive mass removal only to find out that the lump he felt was benign, leading him to the point in his life where he too felt he was ready to give the AFW2 program another shot. More parallels for Guinn and Knight came after both received orders to Tyndall. The similarity momentum was back in full swing. The pair made master sergeant the same year during each of their first senior NCO boards. With both willing to participate in the AFW2 program, Knight, who had been previously selected as a part of the Warrior Games team in 2015, recommended Guinn for a spot. AFW2 prides itself on providing an uplifting, rewarding and inspirational experience for the athletes and their families, but what they do as well as provide lasting connections for everyone involved. Having a profound belief that being part of AFW2 significantly changed their lives, the pair learned that their invisible wounds wouldn’t hinder their career, but instead, allow them to become part of a family that understands what they are going through, and has provided them with tools to get back to normal. Just as fate might have had a hand in their meeting, the program gave the two a chance to not only deal with issues long buried; it showed them how to thrive and proved you don’t need to suffer alone. The commonalities between the lives of these two warriors are uncanny and extensive; from growing up in the same city and joining the Air Force in the same year, to a traumatic run in with an IED on the same day and similar career assignments and progression, Guinn and Knight have forged a friendship built upon on a life of shared experiences.